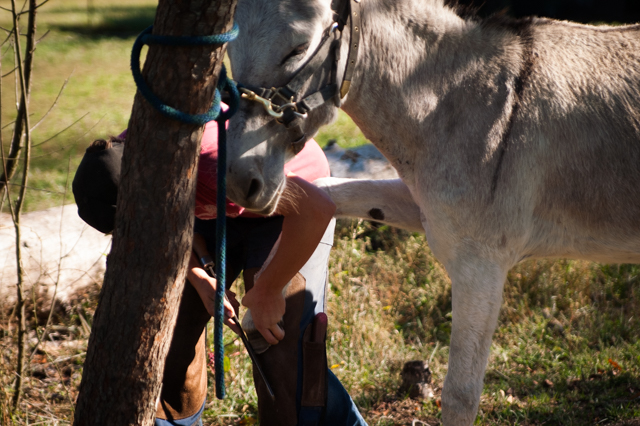 Dolly is on an every-six-weeks schedule of hoof-trimming and it has been so interesting seeing the farrier students come through the program. 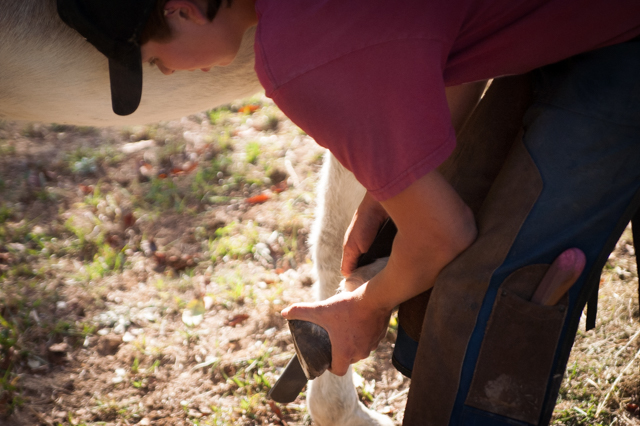 They are here from all over the country, as training opportunities are thin on the ground. Last time we had a burly man from New York. Today a slip of a girl from Alaska. It's also been a huge satisfaction to see Dolly progress from horrified hysterics (her first trimming) to calm co-operation (today). She was so patient through the first two hoofs, and didn't get testy at all until it was time for the last two. I also got the farriers to get her bulky halter off her (she's had one on ever since we got her), and put on her new delicate plum-colored one. Then, at dusk, I took that one off! And for the first time in her adult life, she's got nothing on her head. That makes me happy! At least until I try to put the halter back on her tomorrow. No, I know it will go well. We love each other now. It's good that she seems to be willing to get used to new ways. What happened with the last two hooves? Farrah, the young lady student got a little help from the teacher! They held her still.